At first glance, you might guess that this home is located on a patch of farmland in the southern States. 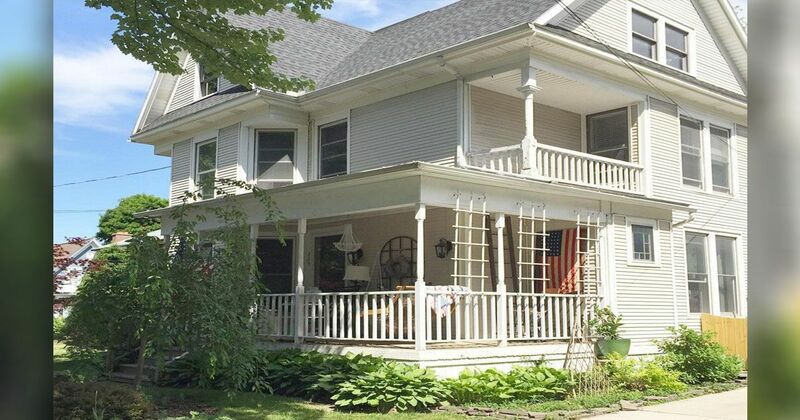 To be certain, the style and stature of this 1850s home definitely channels a farmhouse vibe. In reality, Tina, her husband, and their four daughters live in a suburban locale in western New York. Tina, the voice and inspiration behind Union Willow, has an obvious love of textiles. Each room in the home features a collection of stunning fabrics. In addition, the home itself has great architectural bones including original hardwood flooring, a large fireplace and a sunny front porch. Working with the style of the home, Tina has painted the rooms in muted tones that allow the historical details to stand out. Personal touches such as accent pillows, of Tina's own design, add to the home's inviting atmosphere. All of these aspects make the home behind Union Willow a memorable one. The application of faux brick wallpaper adds depth, and a touch of history, to the home's entrance. The dining room features a set of 3 windows that allow plenty of natural light to fill the space. A section of wall in the dining room is the ideal spot for a reclaimed bench and cozy textiles. The gallery wall showcases an eclectic collection of family photos, wood accents and paintings that act as a focal point for the space. The fireplace mantle and surround have been painted a soft gray to coordinate with the furnishings and decor of the room. Classic touches like the upholstered headboard, vintage mirrors and scalloped accent pillows add a feminine touch to the master bedroom. An unexpected touch of natural wood, in the sliding barn door, acts as a physical barrier between the bedroom and ensuite. The color scheme of the bedding is the ideal jumping-off-point for the design and direction of the remainder of the room. Before you leave, take a moment to share this article with your friends on Facebook. Once you take a look at the pictures below you will begin to understand the uniqueness of this farmhouse located near Port Perry, Ontario, Canada. This expansive home is a country paradise that seamlessly blends old world craftsmanship with modern comfort.